By the time, we hit the main north-south expressway E 1 in Malaysia, my watch shows that it is already 11 o' clock in the morning. Malaysia is spread over a distance of 700 Km in north-south direction, compared to its highest east-west width of only 300 Km. This is why, its main expressway E 1, traverses a distance of almost 770 Km from the southern city of Johar Bahru, to northern town of Bukit Kayu Hitam, located almost on Malaysia-Thailand border. I had a recollection of this road in my mind as a very wide and busy artery, when I had travelled on this expressway about 8 or 10 years before. Today, Somehow, I feel that this 4 lane road is not all that great, as I always remembered it. I give a little thought to this change in my perception. The reason must have been the 6 lane expressway near my home town of Pune in India to Mumbai, which was not even ready during my last travel here on this road. I realize that I am now comparing in my mind, this road with the Pune-Mumbai expressway and that is the reason for this change in perception. Earlier, we had crossed the border check point between Singapore and Malaysia under just 10 minutes. You do not even have to get down from the car. The road from Singapore to this border point, known as 'Second Link,' branches off into 4 or 5 lanes near the immigration check point. On the curb of each lane, a counter has been set up by Singapore immigration. Just stop the car near any of the counters, hand over your passports. You can not see what happens inside the counter, but passports are returned within few minutes. After this, you proceed ahead on a no-mans land, which is a actually a bridge. On other side or Malaysian side, again similar counters have been set up by Malaysian immigration. Repeat the passport handing over procedure and then slow down near customs counters and if they do not ask you to stop, just proceed. Perhaps, since prices of most things in Singapore are much higher than in Malaysia, customs officers are aware that people may not be be taking any contraband with them from Singapore to Malaysia and do not really bother you. Malaysian expressway E 1, even though slightly narrower than Pune-Mumbai expressway, is now equipped with smart card sensors on each and every toll gate. You need to recharge this 'touch and go' toll card, with requisite amount in Malaysian Ringgits. Thereafter, on every toll gate, there are small machines available. The smart card is just to be touched on this machine. The machine automatically debits the toll amount from the amount stored on the card and opens the barricade in front. The entire process may take 2 or 3 seconds. In India, we have to stop the vehicle at the toll gate and give cash to a cashier, who gives a receipt and then lifts the barricade, easily wasting few minutes. Comparatively, this is a much better arrangement no doubt. Speed limit on this highway is 110 Km per hour, but two wheelers are allowed on the expressway, which means that cars and other vehicles have to be driven much more carefully and you can seldom exceed speed of 60 or 70 Km. Surprisingly, I find that most of the drivers here tend to follow all traffic rules and drive in correct lane, which makes things easier. There are pleasant looking green stretches or lawns on both sides of the expressway, that look regularly mowed. In a few spots, I can see workers mowing the lawns with machine operated mowers. Overall, the upkeep and maintenance of the expressway appears to be of a very high order. The road side scenario appears more natural or as nature would grow it to my eyes, which are accustomed to Singapore' disciplined and orderly landscapes, where even the trees have to grow in orderly fashion like everything else. The trees, shrubs, growing here on road sides look as nature have made them: disorderly. Beyond these green lawns and few trees, I can see all along the road, miles and miles of palm trees. These trees give palm oil to Malaysia, which is exported and the farmers earn good money. These vast stretches of palm trees, somehow create a sour feeling inside me. Economically, these fields might be a boon but what about the damage to biodiversity here, when only one type of plant is allowed to grow over hundreds of kilometers. 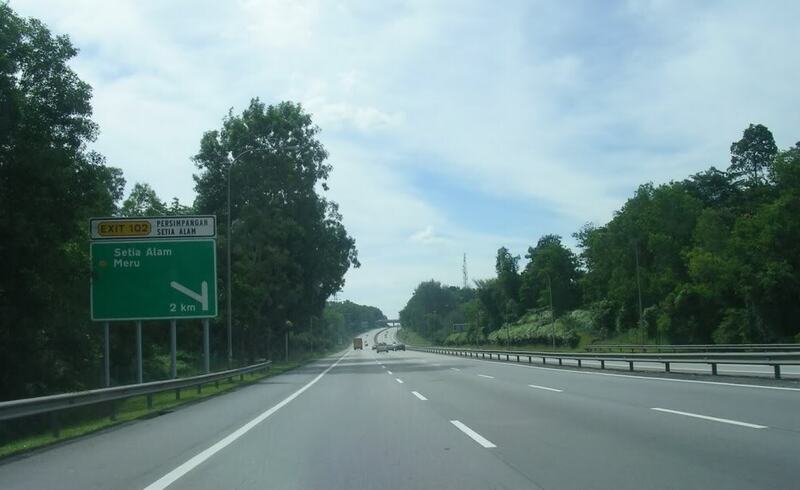 After a pleasant journey of about 2 hours, we can see on the road side, the road sign we are waiting for: which says 'Ayer Keroh exit 1 Km.' We change the lane and the exit is right ahead. Another 2 second stop at the toll gate and I see signs, such as smaller residential buildings, traffic lights in squares, all around me, which indicate that we are in the vicinity of a medium sized town. About a decade ago, I had visited for the first time, a restaurant named as 'Melaka Spice' in the Koregaon Park area of my home town, Pune. After that visit, I had gone there several times again to enjoy excellent Thai cuisine. Since then, this name 'Melaka' had held some kind of fascination for me. 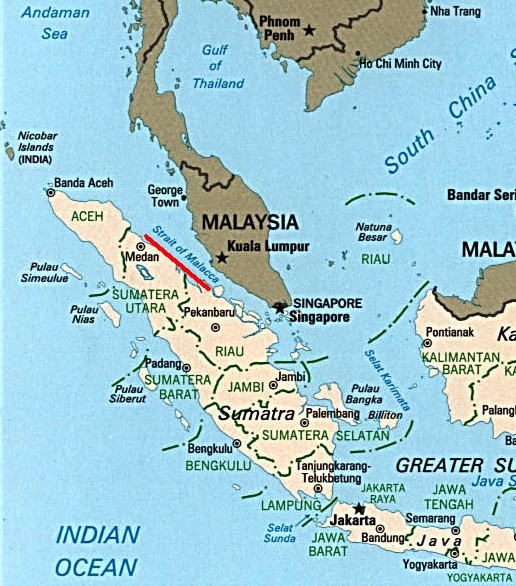 Later, some information about a narrow strip of sea between Malaysia and Indonesia called 'Melaka Straits' came into my reading. I had decided then, to make a trip to 'Melaka' sometime in future. Today, my wish was getting fulfilled. The scenes on the road are very similar to what one can see in medium sized towns like 'Sangli' or 'Miraj' in India. Roads, squares and vehicular traffic are quite comparable. But, people appear to follow road and lane discipline well. No one seems to follow here horrible driving habits of drivers from my home town Pune, such as turning right at green signal, ahead of other vehicles, when the vehicle is standing in the left lane or suddenly turning left from right lane, when 'No left turn' board is being displayed. All 2 wheeler riders are seen riding helmets according to the rules. They do not appear to face any great hardships that 2 wheeler riders in Pune claim to face, when asked to wear a helmet. Travelling through heavy traffic for about 15 or 20 minutes, we finally succeed to reach our hotel. Our hotel has a tall 25 storey building. We ask the valet to park the car and enter the hotel. 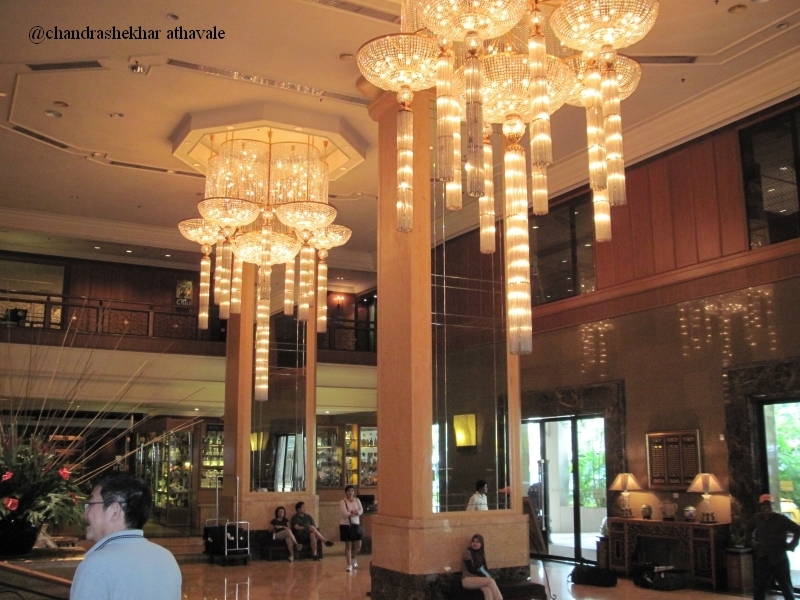 The first thing that I can see is a huge lobby with two giant sized chandeliers with hundreds of glittering lights and scores of mirrors placed at several strategic points. The first views of the hotel are no doubt impressive. After finishing all the formalities like check in and handing over baggage to bell boys etc. I finally reach my room. The room has an oversized glass window with a crystal clear view. I slide the window curtain aside. The view outside is absolutely stunning. 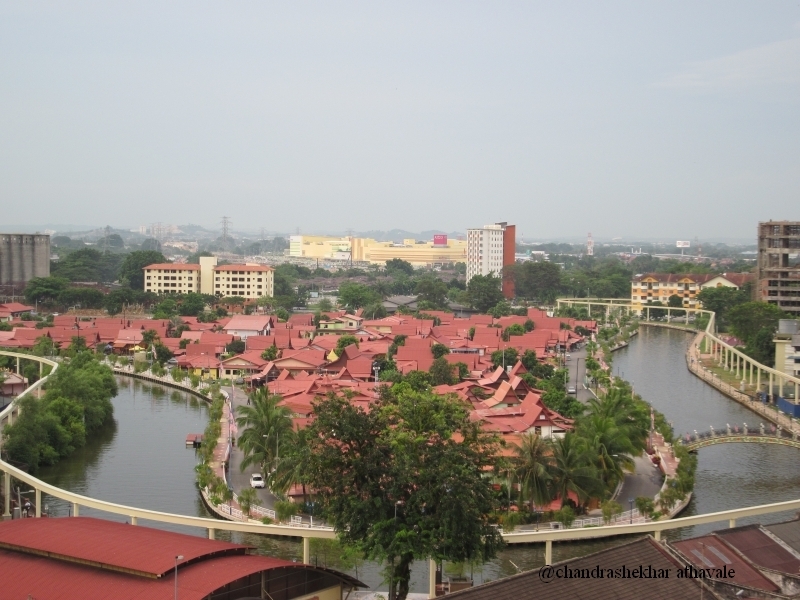 I can see the beautiful Melaka river with plenty of water, bending and turning at several places. On the river banks, Malaysian flags flutter in the wind. Hidden behind the river turns and bends, are small cottages with roofs that have been painted brilliant red. All empty spaces between these little cottages are filled with green foliage and fully grown, emerald green trees that provide a strikingly attractive contrast to my eyes. Like any other tropical place, the rains shower 'Melaka' also all the year round, which means that there are no layers or traces of any dust anywhere, commonly seen in all Indian towns with possible exception of towns in southern Indian state of Kerala. This clean, dust free environment is any way a specialty of all south east Asian towns from Myanmar to Indonesia. After watching the scene outside, for at least quarter of an hour, we decide to have lunch first and then leave for sight seeing. Instead of starting a search for a good place to eat, we take easy way out and decide to eat a buffet lunch at the hotel itself. Only after finishing my meal, my thoughts return again to Melaka. To the east of Indian peninsula and to the south of Indian state of Mizoram, a narrow peninsula spreads for thousands of kilometers to south. At the end or at the tip of this peninsula, lies the island of Singapore. This long peninsula comprises of 3 independent nations: Myanmar and Thailand in the north and Malaysia in the south. 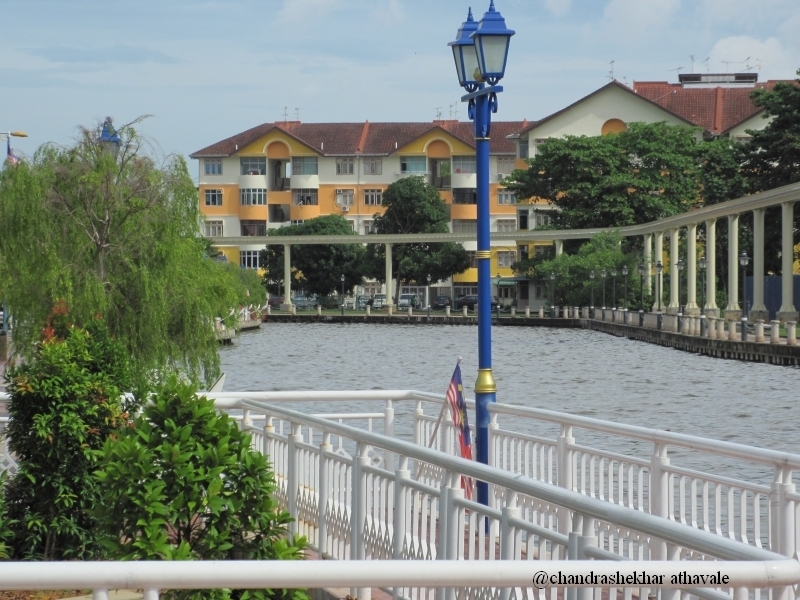 Melaka city, located on the western sea board of this peninsula at about 200 Kilometers north of Singapore, is the capital of a state with similar name, within Malaysian federation. The sea coast along this land is famous and known as 'Melaka Straits.' On the other or western side of the straits, lies the 'Sumatra' island of Indonesia. The shape of the straits between 'Sumatra' and Melaka is like a funnel. 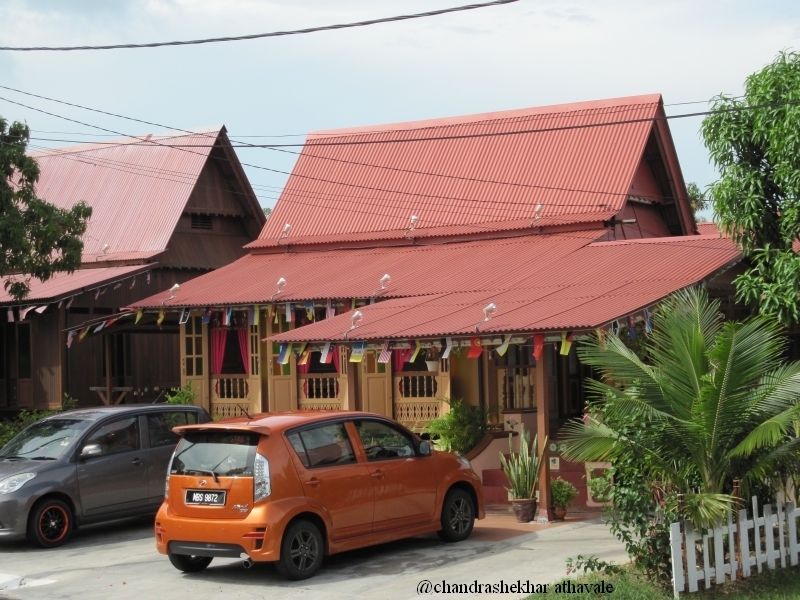 Near about the Melaka city, the straits are only 1,7 mile wide. Through this narrow strip of sea, every year, more than 50000 cargo ships sail and 15 Million barrels of crude oil passes through Melaka straits every day. Almost 70% of crude oil consumed by China moves through these straits. It is said that if due to some reason this sea lane gets closed, half the shipping of the world, would need to change their shipping routes. All these figures only show, how important are the Melaka straits to the world's commerce and trade. I drive away all these thoughts from my mind as I have not come here to study commerce or trade and get ready to step out to the city.